Competitively priced and extremely durable, every single Mercedes-Benz part we carry is meticulously designed and thoroughly tested to the specifications of each vehicle. This is engineering performance at its highest level. We’ve got the right parts for almost every make, model, and year. Superior performance, exquisite style, and cutting-edge technology are what you expect from Mercedes-Benz. Genuine Mercedes-Benz Parts are crafted with superior quality down to the smallest detail. From the smallest washer to an entire carburetor assembly, every part we offer is made to the same exacting standards as brand new Mercedes-Benz parts. Only Genuine Mercedes-Benz Parts can guarantee a precisely engineered fit and finish. We have all the parts you need and dedicated service you deserve. Our Wholesale Consultants and Collision Experts are here to provide you with premium customer service, competitive pricing and absolute piece of mind when your Mercedes-Benz is in need of repair. From the smallest ding to a major auto collision claim, our team is committed to providing you nothing short of the highest quality repair. Whether you are in need of Genuine Parts or Genuine Value our cutting-edge technology will locate the right parts, at the right price, the first time. Finding the right MB Part has never been easier. At Helms Bros. Parts Center, our goal is to make your repair experience as easy and hassle-free as possible. That’s why we offer direct access to our cutting-edge technology to help ensure your vehicle continues to remain 100% Mercedes-Benz. Simply click on one of our easy-to-use wholesale ordering and fulfillment solutions below to start saving both time and money. Those interested in purchasing Genuine Mercedes-Benz parts for resale in the state of New York, can submit a Single-Use Certificate or Blanket Certificate online now or download now and present at checkout. Please note, Resale Certificates are to be used only for those who intend resale or intend to use as a component part of an item for resale. Any other use of the resale certificate can potentially be considered unlawful. Complete Your Application Online Now – Must have Adobe Acrobat to complete online application. To submit your application at a later time, please drop-off or email to our Parts Manager, Richard Mika, rmika@helmsbros.com. 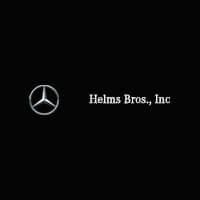 No one understands and cares for your Mercedes-Benz better than Mercedes-Benz, and no one serves you better than Helms Bros. In need of parts or have a question? CLICK HERE to tell us all about the parts that you need, and we will get back to you with a parts quote that can even include our cost of installation.